Hamilton Mattress continues the tradition of exemplary British stop-motion animation – ie Wallace and Gromit – with this story about an aardvark with a keen talent for drumming. 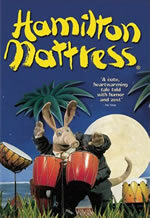 Producer Chris Moll was involved with Nick Park’s groundbreaking series, so it goes without saying that Hamilton Mattress is much better than one might expect. Sludgers (voiced by David Thewlis) is a dimwitted aardvark who wants nothing more than to own a pair of trousers one day. His spectacular drumming ability catches the attention of a talent agent named Feldwick C. Hackenbush (Henry Goodman), a caterpillar struggling to make a name for himself. Feldwick and Sludgers head to Beak City, where Feldwick hopes to find Sludgers a job. The two decide that Sludgers isn’t a terribly theatrical name, and change it to Hamilton Mattress (this is after seeing an advertisement for a brand of mattress that “everyone loves”). Hamilton auditions for a club owner named Senor Balustrade (William Hootkins), who likes what he hears but is unwilling to put an aardvark on stage (everyone in Beak City is, of course, a bird). After unsuccessfully hiding Hamilton behind some bushes while a bird pretends to play, Balustrade comes up with the plan to surgically alter Hamilton’s appearance. Now, Hamilton must decide whether fame and fortune is important enough to change everything that makes him unique. Hamilton Mattress is a delightful short (it runs around 30 minutes) that has enough going for it to please both children and adults alike. Director Barry Purves populates this world with colorful and quirky characters, and does an effective job of turning Hamilton into a genuinely compelling figure. It doesn’t hurt that Thewlis, an extraordinary actor best known for films like Naked and Total Eclipse, is simply wonderful in the title role, giving a performance that’s full of comedy and emotional nuances. Some mention must be made of the film’s production design, which is quite impressive. From Hamilton’s relatively plain hometown to the visual splendor of Beak City, Purves and his crew have created a movie that’s always intriguing on a purely visceral level. And while the story isn’t exactly groundbreaking – the message of staying true to ones self is as old as cinema – the film is nevertheless quite enjoyable and fast-paced. Audio: MGM Home Entertainment presents Hamilton Mattress with a Dolby Digital surround soundtrack. It’s not earth-shattering, but it gets the job done – with the vocal work always crisp and clear, which is really the most important thing. Video: The film is presented in its original aspect ratio, 1.85:1, and the transfer is anamorphically enhanced. This is pretty much a flawless transfer, vibrant and colorful, and there’s nothing negative I can find to say about it. Very impressive. Extras: Hamilton Mattress includes a few extras, starting with a commentary track featuring Purves, Moll, and co-writer John Webster. Though their heavy British accents are, at times, difficult to understand, this is otherwise a very thorough and interesting track. Also included are three short featurettes (one dealing with the making of the film, another with the genesis of the idea, and the final with the voice talent behind the scenes). Trailers for Good Boy, Agent Cody Banks, and The Crocodile Hunter movie are also included. Conclusion: Hamilton Mattress is wonderful fun for all ages, and at such a low retail price, you really can’t go wrong just purchasing it.